Amazon has added Discovery Kids to its Prime Video Channels line-up in the UK. Prime Video Channels is Amazon’s pick-and-choose TV platform, which allows Prime members to add standalone channel subscriptions that would usually come with a pay-TV contract to their Amazon Prime Video on a monthly subscription. Prime members in the UK can already enjoy premium factual entertainment series, such as Gold Rush, on Discovery, reality TV, such as Keeping Up With The Kardashians, on hayu, and movies on MGM’s subscription service. 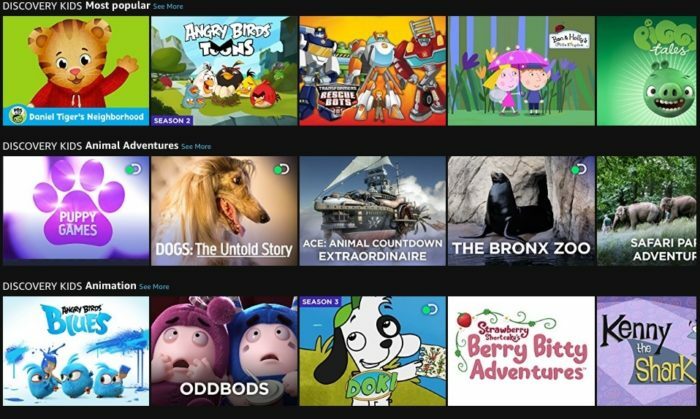 Now, Amazon is expanding its family offering with a new bolt-on subscription to Discovery Kids. Costing £3.99 a month, Discovery Kids gives Prime members the chance to subscribe to watch a selection of fun and educational kids’ favourites aimed at 4-8 year olds, all in a safe environment that parents can trust. Prime members and their families can look forward to following the adventures of Angry Birds Toons and Peppa Pig, delving into the magical world of My Little Pony, being part of the yummy world of Strawberry Shortcake’s Berry Bitty Adventures, and joining the fight with Transformers Rescue Bots. Discovery’s own educational programmes are also available, including Doki, Meet The Penguins, Dogs: The Untold Story, How Do They Do It – Kids, and more.